This is not the ballot paper I want - I want a single question on independence - but I believe that if the consultation exercise, plus perhaps the polls, shows a clear wish for other options to be presented, then as a democrat, I believe they must be offered in the referendum. I should add that I believe that devo max would be dangerous for the SNP, that it would be unlikely to be delivered after a NO vote on independence even though a majority of the Scottish electorate voted for it. Despite that, I still feel it must be offered if the electorate want it. My ballot paper offers what I consider to be the maximum reasonable number of options, with only one option being selected. i.e. it is equivalent to a first past the post Westminster election ballot for an MP in a constituency - no proportionality, only one choice made, only one choice can win. 1. It offers clean-cut choices. 2. It doesn’t allow double counting, resulting in a contested outcome, e.g. 51% vote for independence, 70% devo max. How could double counting happen? 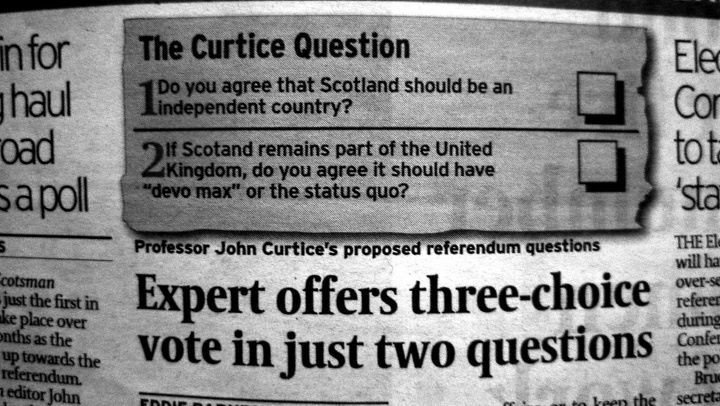 Well, on a ballot paper that allows voting for one or both options, no voter who wants to retain the Union will vote for independence, but some independence voters might hedge their bets and also vote for devo max. For example, on a ballot of 100 voters: 51 vote independence, 49 anti-independence voters vote for devo max, but 21 of the independence voters also vote for devo max. Outcome = 51 indy, 70 devo max. If all the independence voters also voted devo max, the risible outcome would be 100% for devo max, 51% for independence, and both sides would claim a win. The various ways round this dilemma all involve some form of conditionality on the ballot paper voting instruction, all of which, despite strident assertions to the contrary by their proponents, involve potential problems of understanding, complexity, etc. 30% vote for independence, 20% to remain in UK with no further powers, 21% to remain in UK with some further powers, 29% for devo max, i.e all powers except defence and foreign policy. On my methodology, independence would win, even though there is a combined 70% that want to remain in the UK. Such an outcome would clearly create a furore if independence was declared the winner, and it offends against all democratic instincts, including mine. Yet this is the basis on which Westminster MPs are elected in a general election constituency election - it is called first past the post, and it was fought for in a bitter and divisive - and dirty - referendum campaign, with the ftp camp emerging as the winners. Critics of my argument will point out that it is not, however, the basis on which governments are formed, where an ability to command an overall majority in the Commons must be achieved or demonstrated by a coalition agreement before the Queen gives her assent. Alex Salmond managed to form and successfully run a minority government by having the most seats, yet not having an overall majority in Holyrood. But these are false parallels - a referendum is normally understood to be a choice between two options and is neither a constituency election for an MP, nor a Parliamentary election. But what if the above nightmare scenario - 30/20/21/29 - represents the actual balance of preferences of the electorate closer to the referendum period, as revealed by the polls at that time? As a democrat first and a nationalist second, I must say that without a minimum percentage proviso, which would declare the referendum null and void, such an outcome could not be deemed acceptable and would be a recipe for conflict. I wish I could say that I have confidence that somebody somewhere is coming up with the right answer, one that will be immediately acceptable as fair and workable and unbiased by all parties. At the moment, given the inane questions of the media and the politicised, polarised solutions of some nationalist and most unionists, that confidence has not yet been established. And I have no answers, and must fall back on cutting the Gordian knot and returning to my instinctive first preference for a single question, and a simple 51% majority. Democracy is a messy business, but what alternatives do we have except dictatorship and fascism?